We are about to say good bye to present year 2008. It is time to thank God for all the blessings that we have received in this year. Expression of gratitude comes from acceptance of giver of that blessing. The source of any blessing, whether we deserve it or not, is acknowledged. That is what we call thanking. Certain blessings we really we deserve them. But certain others we did not deserve at all. God’s love is the answer to it. He loves us like a father. Let us make an evaluation of what we have done in this year 2008. All of them were to the best of our choice. Each of our decisions was the best of that time. Those would have been different if our attitudes were different. So we have done our best for which God is happy with us. Looking at some of them we feel it could have been better. If so make it for the coming year. Let us not regret about it but be grateful to God for his blessings and plan for next year. Of course we will take with us the good achievements of the 2008 to work in 2009. Prayer: God we thank you for everything that we could do in this 2008. Also we feel so grateful and obliged to all your blessings for the year 2008. Christmas is the celebration of the great love. God the father showed this to us through the life of Jesus Christ. 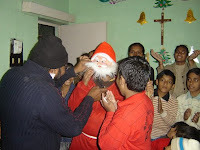 Christmas became a memorable experience for the residents of our locality in Housing Board Colony, Rewari, Haryana. On 25th December 2008, we put up a Christmas programme for the children of our locality with the help of Bro. Leo Antony and the families of Mr. Muniram and Mr. Bajaj Rao. Miss Manisha of 8th standard was the organizer of the programme. Fr. Thomson OFM Cap from Bawal Ashram was present for the celebration. The response of the children and their parents were very impressive and enthusiastic. To my surprise more than 50 children took part the Christmas evening. It would be a cherishing memory in their hearts for a long time. The function started with a short prayer followed by cutting of the cake. There were dances, story telling, narratives etc. The children enjoyed snacks with cake there after. Another interesting part of it is that they themselves came and decorated the house and surroundings for the programme. The people of our locality always appreciate our presence and activities and give lot of encouragement and support for our growth in the capuchin way of life. The birth of Jesus was so planned and the parent was so prepared. The birth was acknowledged by shepherds. This is the way a person is born. Jesus was fully human. This means, in the perfect way of the birth of the human being child Jesus is also born. The angels’ singing was heard by shepherds. The birth of any child is in the same way. But many do not experience all these, because there is no enough preparation. Christmas is also a time to remind us about the need of preparation of new child and recognition of the birth. May the CHRISTMAS BLESSING be with all my readers. Parents have duty to care and bring up their children. If the children are spoiled all blame the parents. There is divineness within a person. This holiness has to be cared like a parent cares his child. It needs constant attention, care and so on. This means one has to take care of oneself. Caring oneself is caring the God within the person. The God within has gift of God. It is our duty to care and nurture it to its completion. There comes our spiritual success. Years ago when I saw the Haley's comet it dawned in me that this event is seen for the last time. Last week when the moon became closer after a period of 15 years I wondered if I would live to see it once again. It is the same as seeing our children growing amidst us as they mature with the constant dose of our belief and philosophies. This is what we live by in the process called ageing. We must gracefully accept and go day by day to live with our commitment of our belief. This deep routed spiritual faith should mold us to accept age as the maturing element in certifying us to reach our prime in life. Often we find ourselves conscious of our appearances. Many tend to have all the beauty care to see that their youthful image is maintained. The women are too conscious as their social order of weakness tends to make them feel attractive. Men also in the years try to see that they want also an appearance of attractive elegance. Many spend money/hours to therapies including facial, dyeing, grooming and rejuvenation including many of the religious taking pains to trim, shape and dye to display a sense of youth with visible sagging skins. Is it that we are afraid to age? Why can’t we accept and move on to grow above such physical feature. Isn't wisdom coming within us with every grey hair or are we trying to hide? The answer being that though our body’s age it is the mind that should remain young. Didn't Jesus say: Unless you become like little children – innocent - you will not see the kingdom of heaven? Moses went up into the mountains and returned with the greatest wisdom displaying the Ten Commandments. According to the bible he lost his youthfulness after being in front of the burning bush, returning as a changed wise man with long grey hair and beard. It was the first display of greatness of a person laced with spirituality, induced with wisdom. What makes one to run away from such a situation? Isn't it the fear of death? Many times we tend to hide ourselves behind the mask of reality. To look at death in a different manner is to accept everyday as a day lesser. Live with great respect to the Creator make it different, accomplishing/learning something everyday to build us into a wiser person. As we see the sun rise and set it is also important to equate it to our lives, accepting every day been given to us as another life. It is how we make use of the times of our lives, living every moment of it in good times and bad with good determination avoiding reasons for comparison. Children should be taught to value time, to be accountable for usage of time in studies, sport and leisure. As they grow up, the management of time should be so disciplined that they should never regret having lost much of it for wasteful unproductive need nor laziness or excessive sleep. We need to use every moment of it to learn as much as possible of the miraculous reality of life, the wonders of the universe, the magic of sciences or the personality/history of humanity. Somehow talents are born with such indulgences of interests sown into our personality. Many of us have so many unborn talents but we leave it to hibernate. Our minds should be woken up every moment with sharing in spreading good values of life. It structures our brain to have the feel good factors to have contention to bring about our happy state of mind leaving besides any guilt feeling of wasted time. The best time for one to consolidate and establish their foundation of life in the years from 23 to 45. Men should mainly take this as the best part of their life so that all strain and tensions can be absorbed by the youthful body. Working harder at these ages is important as much as financial management to steer the family they need to support. Proper discipline with the spouses can assure good happy living with contentment of their resources. Happiness comes with a ticker -- Live according to the situation, be cheerful, and think you are fortunate. Money alone will never buy happiness but love will. Time spend to overindulge in work should be restrained. Growing older we could never take as much of the strain as we did years ago. It would be better to reduce strains on body and mind with this feeling of satisfaction of the life spend. By contributing our knowledge with faithful humility our expression of giving wisdom enlightens us. We had graduated in projecting life with different prospective achieving doctorates/masters in guiding younger lives. This could be the best feeling reassuring us having navigated to achieve our goals with the best approach. No negatives or foolishness would stand up unless it had taught a lesson to accept, learn and grow on, continuing with the duty given to us - OUR LIFE. Cultivation of many such views could develop many of us to face life in our pursuit for happiness. Time never waits but we must never let it pass without making use of it every moment. Such treasures are the best memorable moments of our life as we sit down in our last chapters to rewind and play as many times to be satisfied to ourselves, to fulfil our dreams with ideology sown in from our understanding of Our Way of Life. Jesus Christ came to us 2000 years ago to spread the message for us to cultivate within a moral, social code of life. The ultimate aim was for us to grow in the images of God, to respect and live happily. There was no mention of fear inducement, no mention of action taken but only the principle thought that one needs to be happy one has to do certain sacrifices but with humility, unselfishness and faith. Sadly we are moving away from what the practical expression of the designed Christian life. Our time seems wasted on building infrastructures, establishments, and petty politics rather than improving lives of our brethren. How much can we change? Who must take the initiative? Who must benefit? All but for our struggle to have a Life and to be Happy in the second place. Terrorism has no heart, no feelings but humankind has to live with but we need to make corrections in our way of life. Every citizen should wake up to patriotic feelings shed away differences of religion, caste, region and vote to bring impartial candidates. Support the law keepers to allow stringent security at any point, inform about suspicious characters and activities, allow a feeling of unity rejecting acts of divisive politics. Any body breaking the law starting from basic traffic crimes should be dealt with severely as to bring about the discipline of a law abiding nation. Even with any sort of security if traitors within our country help these perpetrators we will still end up in such similar sieges. Have any country been able to stop the sea piracy that still goes even with availability of the latest gadgets onboard? But the enemy also tends to have the advantage of these new found technologies with the type of funding received from such supporting bodies. Hence only with sensible citizen assistances can we eliminate such barbaric activities. Yes, money is an element which could buy cowards who would rob our country of a peaceful state and all our NRI's should remember not to criticize our country but help to build a nation which has 110 crores of peoples of all diversity rather than compare it other nations developed over a longer period with a limited controllable population. In our humble way we need to start addressing problems of enmity, shed differences in communities, win friendship with our show of compassion and love rather with threats of war to endanger more lives with terror sown into young minds. If we could induce discipline into our society it will in a period of time improve sensible thinking into the public to elect better candidate rather be fooled by false election promises. If Indians own and manage many great MNC's in the world with international standards, an indicator that we possess the best people who can manage our country in good sensible manner provided the public be able to impartially sort the good ones. At this hour of crisis we must adopt practical thinking with the limited resources within our system. Without wasting time the present existing laws must be enforced in total faith, book all those politicians who think above the law inciting communal feeling. All such fundamental groups inciting/terrorising such passion also should be banned to start putting our house in order. End result the job of the security officers would become easier with freedom to concentrate on security management. This the People of India should stand up together to make our Land free from such hate crimes. Donald DCruz, Mundakkal West, Kollam -691001. Some animals are natural enemies because of hunger; humans are often mutual enemies because of greed and pride.